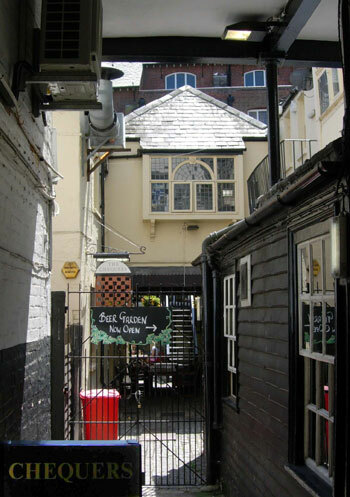 The Chequers is down a lane off the High Street, behind No. 132, and dates from the fifteenth century. It is Grade II listed together with No. 132 in front (List Entry No. 1186736). It was in the parish of All Saints until that church was deconsecrated in 1971. In the fifteenth century this was a private house used by a moneylender, and this probably explains its present name, as the chequer board was the old money-lending sign. The house was bought by All Souls College in 1466, and rebuilt as a tavern by Alderman Richard Kent in about 1500, when it became known as Kent’s Hall. In 1696 John Clayton paid tax on twenty windows at this tavern. Howell Goddard lived here until 1776. George Stroud was the innkeeper here by 1839. The 1851 census shows him living here with his wife Mary and his son, plus two servants. In 1861 he was still the innkeeper here when he was aged 65.